Fontana USD desperately needed a flexible & budget conscious prototype elementary school that could handle unique site configurations with ease and serve as a template for future schools while fulfilling the district’s educational and sustainable goals. Thus was born Dolores Huerta International Academy. Designed to house 722 students, it is the first prototype with the flexibility and efficiency of a two-story all-under-one-roof school design concept. Two double-loaded wings of teaching spaces surround a central core of the library, administration, and shared learning spaces. The flexible sizing of the wings and placement of modular components allow the design to be modified for proper site orientation and varied functional requirements. A mission-style vernacular was selected for the design to integrate with the residential community surroundings, while single story massing elements have been incorporated to break up and reduce the scale of the 71,000 square foot two story building including overhangs and lunch shelter. 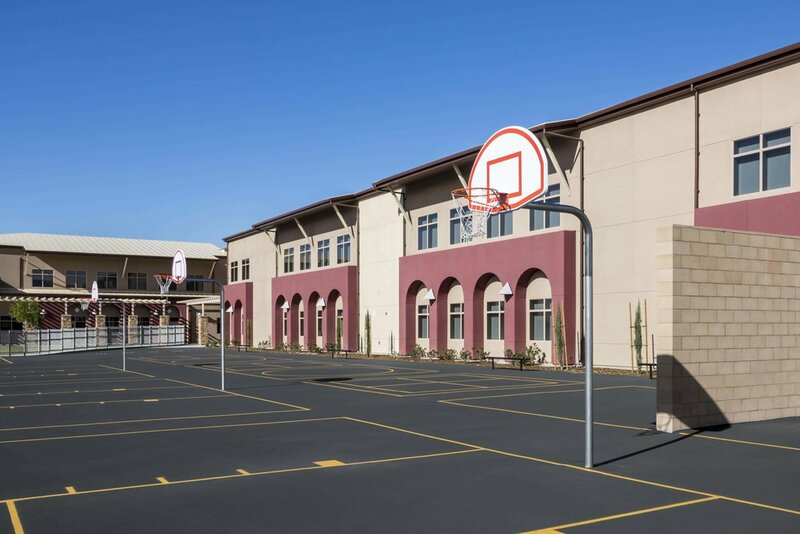 Dolores Huerta International Academy overcame the challenge of a narrow 6.5 acre site by orienting the long wing of classrooms east to west. North & south facing windows are tinted and protected by pop-outs, overhangs, and interior sun shades. These measures allow for natural lighting and great views while protecting from direct sunlight. This orientation also allows for the use of photovoltaic panels. Anchoring the wing, a large MPR and food service is available for the community and after hours school functions without requiring access to the rest of building. A smaller wing used for kindergarten on the first floor and their 5th grade “buddies” on the second floor is oriented to the south from the central core and includes another indoor social gathering space which provides refuge during particularly hot or windy days. 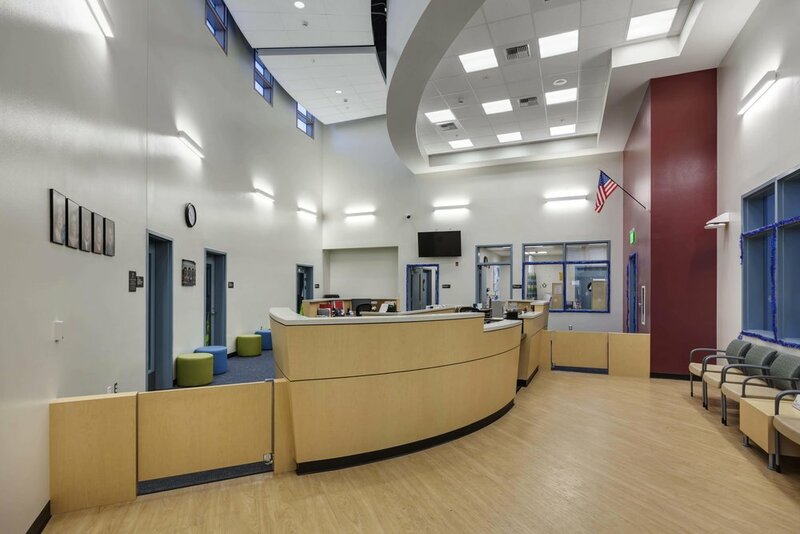 The all-under-one-roof two-story design of Dolores Huerta International Academy provides for a cost effective, well-organized, and energy efficient solution. Grouping the functions of the school within one building helps students and faculty quickly access campus functions and shared spaces while remaining in a secure zone and away from the climate extremes of Fontana. This “all under one roof” configuration greatly reduces the amount of exposed exterior wall in comparison with similar multiple building schools, effectively limiting heat loss and gain within the building envelope. Increased insulation, high efficiency mechanical units (15 SEER), demand control ventilation, and efficient lighting and lighting control system, alongside the integration of an energy efficient building design and orientation have increased the performance of the building to exceed Title 24 minimum standards by 27.1% and helped bringing the project closer to its goal of LEED certification.